In Cairo's chaotic streets, Sukara's agonised wails drowned in the blare of car horns. Abandoned in a pile of household garbage within sight of a mosque and a cafe, it was three days before anyone in the working class neighbourhood offered help. When local accountant Mohamed Mostafa eventually took pity on the stricken donkey — giving her some drinking water and arranging for a place in an animal shelter — it was already too late. “She was one of the worst cases I've ever seen. She was crying and wailing like a human being,” recalls Salwa Abdoh, a volunteer at the Egypt Horse Project, a non-governmental organisation based in Giza. The torment didn't last much longer. Sukara, as they'd named her, died two days later. Donkeys are as much a part of Egypt as the pyramids, a living, braying link between the agricultural heartlands and its choked metropolis. Whether carting produce, building materials and garbage in Cairo or tilling the fields of the Delta, it's hard to imagine the country without them. Familiarity, though, has bred contempt. The most mistreated of all Egypt's animals, their name is a byword for laziness and stupidity in the local slang. Some farmers call donkeys “mute birds” — beasts of burden that take the stiffest punishment without a whine of complaint. On a scorching day in early summer, veterinarian Shaaban Fayez is driving east along the four-lane highway to El-Saf, an area in Giza, which is home to hundreds of informal stone factories where animals still do much of the labour. In one of El-Saf's ramshackle outdoors factories, about 100 workers, some of them children as young as seven, are carting piles of stones to the furnaces that bake the bricks that made the apartments. Working alongside them for at least eight hours a day are about a dozen donkeys, each of them bearing deep lacerations across their backs and shoulders. Abdullah, a 17-year-old, says the whip in his right hand is vital to his success. “I always whip the donkey in the same place — when you hit them on the wound, it really hurts and they move faster,” he says. One of his colleagues, Ahmed, 14, has worked in the factory for three years. This is where Fayez tries to make a difference. He works with the Society for the Protection and Welfare of Donkeys (SPWDME), a partner of the international Donkey Sanctuary, which offers free veterinary services to donkey owners in Egypt and runs mobile clinics in the capital and the Delta province of Qalyoubeya. 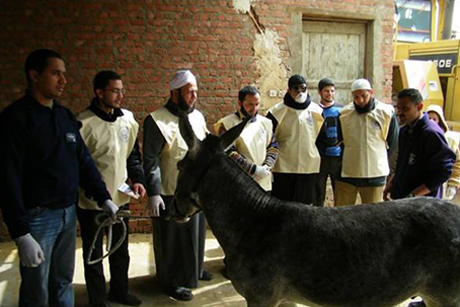 When he visits El-Saf, he treats the donkeys' wounds and urges the workers not to mistreat or overload them. Since the organisation began its programme, most of the factories now allow the animals to exercise and feed in outdoor yards, Fayez says, both making them healthier and more productive. They've also encouraged workers to use proper harnesses on the donkeys, rather than makeshift reins and tack that can injure them. However, harnasses are not the only problem. Many donkey owners put wires on the donkey’s nose, to cut the area and control them more. Other owners put sharp irons in the donkey’s mouth which end up hurting their tongues and jaws. “Of course, after 10 years of hard work, their body begins to deteriorate and their joints break down,” says Farid Shawky, the society’s Harnass Project officer. According to the society, Egyptian donkeys tend to live for 15 years only, whereas the life expectancy of donkeys should be 25 years. Donkeys first appeared in Ancient Egyptian decorations around 3,150 BC, but debate persists over when exactly they were domesticated. The most common theory holds they were brought to Egypt in about 6,000-5,000 BC from the Near East, according to Salima Ekram, professor of Egyptology at the American University in Cairo. Another school of thought suggests they were domesticated within Egypt from African stock. Donkeys were also slightly associated with the God Seth, which Ekram says was the God of "chaos, liminal spaces, the desert and wild unclaimed places." “Donkeys managed to get Egyptians up and down the Nile Valley and through the Eastern and Western Desert, and they were a key component for Egypt being able to communicate with Africa and the Near East,” Ekram says. Their importance to trade made them second in value only to cows. Their place in society was enshrined in Ancient Egyptian fables, like that of the so-called eloquent peasant, dating from the Middle Kingdom, about a donkey owned by a Wadi Natroun farmer which eats the crops from someone's field and causes upset. The incident began on 11 June at 2pm, when a Maltese resident of Alexandria borrowed a donkey from an Egyptian “Makkary,” the term coined at the time for donkey owners. However, the Maltese man did not return after the agreed upon hour. When he finally showed up, a fight erupted, which led the Maltese man to stab the Egyptian, wounding him. The crisis deteriorated leading Egyptian locals to begin clashing with the Maltese. Knives and daggers were drawn and European residents began shooting at pedestrians from their windows. “At the time, many foreign communities lived in Alexandria. And they often united against Egyptians when there was a crisis,” says El-Gemiey. The foreigners complained that Colonel Ahmed Orabi, the Egyptian nationalist and prime minister at the time, was not protecting them, leading to the British occupation of Egypt. “So, you can say that a donkey was the reason behind Britain’s occupation of Egypt,” laughs El-Gemeiy. The situation for donkeys dramatically changed in modern day Egypt. In a country where animal welfare is considered a joke by many, donkeys get the worst of the abuse. “Cats and dogs can run away, but the donkey is owned and tied and cannot run away from this abuse,” says Amina Abaza, founder of the Society for the Protection of Animal Rights (SPARE), which shelters many abused animals. Abaza also owns a donkey sanctuary in the Shabramant area of Cairo, which at one point had 18 donkeys. Now only four remain, after Abaza rehomed the rest. One of the cases that remains in Abaza’s sanctuary is Romy, who she rescued from the street in 2004. While driving her car, Abaza saw that the donkey was limping and his owner was hitting him hard with a stick. It turned out that Romy's owner was forcing him to work with a broken leg for one year. Abaza convinced the farmer to sell the donkey to her for LE70, bought a truck and took him to the shelter. The vet took one look at him and told Abaza that he would not survive. Abaza brought him carrots and she and her family made “cuddling” shifts, where they stroked, hugged and kissed the donkey. When the vet came three days later, he was surprised at how well he is doing, and the euthanasia was cancelled. “So, love and some clover resuscitated him,” she says, smiling at the memory. Through the years, Abaza has helped many donkeys. There were times when the donkeys were in such bad condition their owners did not even bother to sell them to her. Abaza also points out that in Egypt many donkey owners scald their donkeys with a hot iron, thinking that this is a traditional cure for all ailments. Last year, a couple of veterinary students sent Abaza photos of a baby donkey being electrocuted alive in the Cairo Faculty of Veterinary Sciences. Many foreigners who come to Egypt struggle to understand the abuse heaped on donkeys. 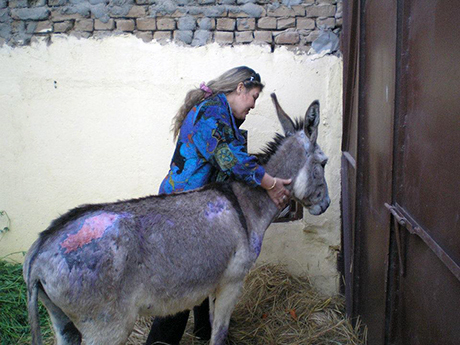 Australian Ashleigh Lotherington developed a passion for Egyptian donkeys and established The Egypt Horse Project on 14 November 2012, after a two week trip to Egypt. Lotherington’s shelter deals with horses and donkeys as well as small animals such as cats and dogs. The project now has 12 donkeys under its care, many of them orphans, abandoned after their mothers died or were no longer able to nurse them. Mr Donkey, one of the rescues in the shelter, was injured in a car accident and had motor oil thrown all over him. Lotherington discovered that he had a broken leg and treated him. “Mr Donkey has a owner who checks on him regularly, but he will never leave our care and he will never have to work another day in his life,” says Lotherington. To this day, Lotherington is baffled at the abuse heaped on donkeys in Egypt. The problem is that donkeys find it hard to convey their pain when abused. But donkeys are not stupid, Shawky says. They are intelligent animals who are able to return home alone without their owner and have a very good memory. There are many reasons why donkeys are abused in Egypt. In modern Egypt, negative attitudes are often associated with animals. That’s why the word donkey, or “7omar” in Arabic, is one of the most common insults in Egypt. In fact, in April 2014, an Egyptian farmer was jailed after he called his donkey Sisi, after President Abdel-Fattah El-Sisi, who at the time was Egypt’s minister of defence — a man considered by many to be a national hero. In 2012, Egyptian MP Ziyad El-Elemy almost had his parliamentary immunity lifted after he likened former military ruler Mohamed Tantawi to a donkey. These are the more public spats, but the word “donkey” is used every day as an insult by Egyptians. However, he points out that the reason why donkeys are seen as negative have a lot to do with the rural-urban divide in Egypt. A few decades ago, many rural Egyptians began to move to the city, much to the chagrin of Egyptian urbanites. This is seen in stories about the fictional “wise fool” Guha, who is accompanied by a donkey. Stories about Guha are often told to Egyptian children to teach them moral lessons. “Guha is someone who is seen as a buffoon, dumb and simpleminded,” explains Iskandar. One of the most popular Guha anecdotes has him riding the donkey the wrong way. “It means that if you want to exploit someone, you will work him hard and pay him little — just like a donkey,” says Iskandar. But the situation is different with Egyptian farmers. Indeed, in the small village of Tokh, the relationship between donkeys and farmers is a very strong one. Whereas city dwellers have a “business” relationship with a donkey, farmers have a more emotional attachment to the animal. “When I was born, there was a donkey in our house. I used to play with him,” says farmer Mohamed Rageh. Rageh, who plants wheat on his land, like many other farmers, uses his three donkeys to navigate through the fields and transport his produce. For most farmers, a cow, which costs around LE10,000-15,000 is the most precious animal. Donkeys in Egypt usually cost anything from LE200 to LE1,500. For the older villagers, the donkey is also used for transportation. Nonetheless, there is no chance that donkeys will be outdated. Many farmers, though, feel resentment at how Egyptian urbanites perceive them. The fact that Egypt’s farmers get more sidelined everyday by city dwellers inspired one Cairo-based artist to create the Donkey Symphony, a slow mournful piece of music in which donkey brays were mixed with classical instruments. The “Red City,” is name given by architects to the ashwiyat, or slums, that make up 40 percent of the capital. These ashwiyat have expanded in the past few decades, eating more and more of the countryside, based on false hope for a better life. The donkey, says Baladi, has made the transition along with the Fallahin (peasants) from the countryside to the ashwiyat. “In the song, the donkey brays are a cry for help,” says Baladi. Baladi is not the only artist to be inspired by donkeys. 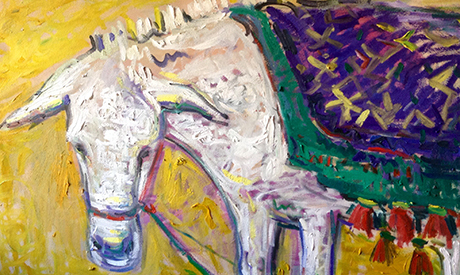 Painter Miriam Hathout sees so much beauty in these abused beasts that she opened a gallery made up only of donkey paintings. Many animal activists express concern on how donkeys meet their end. Fayez explains that it would cost LE150 to put down a 150 kilogramme donkey. As a result, donkeys are often passed from one owner to another until they die. Abaza points out that in other cases donkeys are simply abandoned. “When the donkey gets sick and old, they just leave him in the desert so he can die alone,” she says. In some cases, they face an even worse fate. Thousands are still being tortured and murdered in Egyptian Jails but head is all about Donkeys. what you lacked in live,you get back..
Now a days donkeys worth more than human. i am here arround a long time now concidering as an expat,even longer as the government wanted it to be i witnessed hoorendous stupidness in day to day ways of humans acting on each other but what really makes my heart sometimes sick is to see the helpless victims of this maltaught humans,the working or just living animals the working ones are usual the base of the families income and just look,how they are treated....incredible stupidness is on its way there..every farmer knows to treat his tractor better than the cheaper compagnom by his side... i have witnessed,what this little animals can perform,once well treated,not punnished and well fed,they well do whatever they can to support their boss on the other hand,in this country,where humans have no sense for their fellows,how should they have a sense towards fellow animals? i dont understand this point,as in equally bad educated other countries with different believes so where lies the difference? fort this great article! Nothing describes a society better than how it treats the weakest of the weak. Totally rotten is an euphemism but this sick behaviour is common in 4th-world countries all over the world. Just go to Cairo's Zoo and you are fed up. I have learned every place I've been that people who abuse animals are very likely to abuse humans. Animals not only work for us, they are our companions, they feed us whether it's with meat or milk and they clothe us. Despite that even, they are living creatures that deserve our respect and gratitude. Thanks, Expat, for mentioning ACE and AWOL in Luxor, but we should not forget the incredible work of "Brooke Hospital for Animals", British charity, working already in Egypt and Jordan since 1934 and doing a great job since then in their clinics in Luxor, Cairo, Assuan, Alexandria etc. saving thousands of animals and doing millions of treatments especially for donkeys and horses free of charge for the owners. I saw tortured and wounded animals there and at ACE that brought and stll bringing me nightmares... Shame on this society! no,i was not talking about the cats.. They do. They are also aware of how they are lied to and cheated at most every opportunity. That is why so few make return trips although many have other parts of Egypt they would like to visit.This also explaains why tourists stop spending extra money. Once cheated, the money stays in the pocket. The poor treatment of visitors costs Egypt billions in lost revenues. No one cares. An Egyptian tourist was waking on Hollywood Blvd with his Donkey when a lady driving her car got close to them and while rolling down the window she said to him, "Sir, you better take this poor animal to L.A. Zoo first thing to-morrow morning. The Egyptian replied, " No, according to our trip plan, to-morrow we are going to Disney Land "!